Happy (almost) Friday! I had plans to put up an outfit post today with some Riff Raff pieces, but it started pouring yesterday about halfway through taking pics. So, looks like that will go up Monday! I kind of took a little bit of a hiatus this week to unplug from the blogging world and do some much-needed spring cleaning. (How exciting am I?) No, but seriously...we'd really like to list our house this summer, so we've been double-timing it around la hacienda, trying to get it re-organized and spruced up. Let me tell y'all something. You accumulate a TON of stuff as a single person, two thousand more TONS of stuff as a married person, and once you have a kid...oh man, forget it. Stuff galore. Our house looks like the site of a Buy Buy Baby pop-up shop. 1. 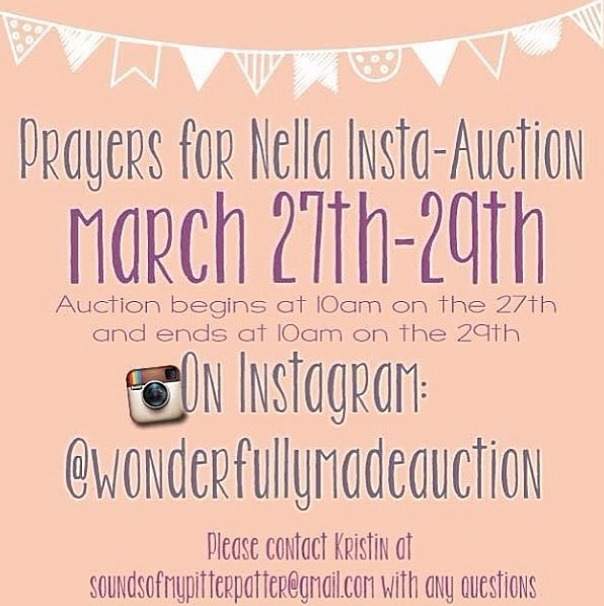 Baby Nella's Instagram auction starts TODAY! Get yourselves over to Instagram and follow @wonderfullymadeauction to bid on items from a whole bunch of amazing businesses, including Crown Beauty Bar, Honey Pie Accessories and many more. Let's raise some money for little Nella and her family! 2. Anyone out there read Divergent? I keep seeing the ads for the movie and I'm intrigued. Should I read the book first or just head straight to the theater? 3. Any suggestions for workout DVDs that won't take more than 20-30 minutes out of my day? I really want to tone up a little before summer, but with Caroline, my time is super limited in the evenings. And ain't no way this girl is getting up at some ungodly hour to do P90X. Alrighty, same place/same time tomorrow. Yes, read Divergent! It is an easy read and then see the movie (especially because the character Four ain't bad to look at!). Try T-25 for an intense 25 minute workout. It is the same guy who did Insanity, but not as insane in my opinion! I have been doing Jillian Michael's 30 day shred on YouTube...it's only 20 minutes, but it's hard! I 2nd the Jillian Michaels 30 Day Shred... and also her Ripped in 30! About 25 minutes or so including warm up and stretches. I bought the DVDs for under $10 from Target and Amazon! All you need is a mat a 3 or 5 lb hand weights. I loved Divergent, liked Insurgent and hated Alliegant... but Divergent is a great read. I've been trying to do Pop Pilates on you tube! Also... Divergent. READ! I agree with Jacquie that the first book is the best, but once you start, you won't be able to stop. And even if you don't read the books (it really doesn't matter which you do first), DEFINITELY go see the movie!! I thought it was kind of like Hunger Games meets Twilight (with the dystopian feel and action of Hunger games and the sizzling chemistry of Twilight... minus the annoying Kristen Stewart). Jillian Michaels is great or check out Blogilates.com. Cassey is awesome and has a ton of short, free workouts online. Or, if you're a big yoga fan, check out yogadownload.com for free 20 minute workouts. Hope these help. Jillian Michaels 30 Shred is where its at!! Hi Leslie! I totally recommend 'Nike Training Club' which is a free ap that has 30 or 45 minute workouts based on strength, conditioning, etc. it's your choice. It is like your phone is a personal trainer and the workouts are great! Good luck and please post about it if it works! Jillian Micheal's DVDs are usually around 20-30 minutes and will definitely tone you up. I like her 30 Day Shred and also, Shred It with Weights, which is with a Kettlebell. That is my favorite. Divergent- Love books 1 and 2, but hated the 3rd so much that I am like blah about seeing the movie. Womp womp womp. I recently purchased 21 day fix through BeachBody- love it so much I just became a coach! Let me know if you want any more info- here's my email address lagarr10@yahoo.com. There are 7 workouts- each 30 minutes, plus 10 minute abs. It comes with containers for portioning as well.. I'm sure you will tone right up whatever workout you choose- just in time for Summer! I'd recommend Jillian Michaels' 30-Day Shred as well! I just started reading the trilogy and am on the third book. It's pretty entertaining and the writing is not horrible. I like how amazon offers the sample ooption for kindle. I LOVED Divergent! If you are ever planning on reading the book I would definitely do that before seeing the movie or some of the "big shockers" will be ruined. It's a thick book but it was a super quick read for me. No big words and large print (in other words, my perfect book). Take a look at barre3.com--they have online workouts and you choose the amount of time you have and the area of your body you want to work. There's also an app that has streaming workouts for convenience. But don't make the mistake of thinking the 10 minute workout would be easy--I learned that one the hard way! Tracy Anderson metamorphosis or transform; 20-35 minutes of HIIT and you feel great afterwards!